Paint.net is an application I’ve found myself using on a day to day basis over the last couple of years. In my opinion it’s a perfect bridge between the ridiculously simple but underpowered ‘Microsoft Paint’ that’s bundled with Windows and the powerful but expensive to buy and difficult to learn ‘Adobe Photoshop’. 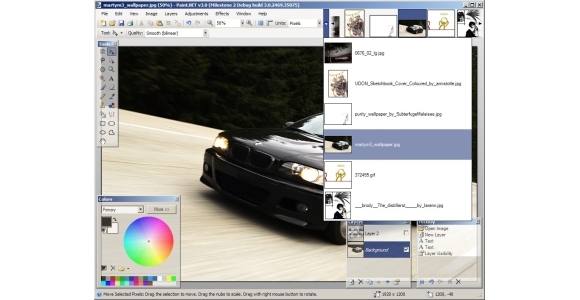 The majority of users will find the features of Paint.NET more than enough for day to day photo manipulation however, also thrown in to the mix, are a number of extremely powerful tools. Firstly, the application has layers; unless you’ve ever used layers it’s difficult to explain in words exactly what they are and how they can help you. The simplest way to explain them would be to think of them as a number of transparency slides, which when all stacked and viewed together form the basis of a whole image. If you change one of the individual slides the overall image will look different, but no changes will be made to the other slides. This means that changes that you make to one layer which are later altered won’t result in damage to the image caused by previous alterations. Another good feature is the way that the application allows you to view multiple images all at once; rather than having a number of windows that can be minimised and reopened as and when necessary, Paint.NET has a clever style of tabbed interface. In order to navigate between open files you simply click a thumbnail of the image from a scrollable selection on the top right hand side of the screen. I did fear that development on this fantastic free application had become stagnant – the last release (3.36) was well over a year ago and even that only offered minor improvements on earlier versions. Having obtained the beta for version 3.5 which is due to be release as a finished product next month it would appear the developers are back on track. Notable improvements include improved memory usage, a Vista / Windows 7 style glass look, new effects along with the usual helping of bug fixes and rendering improvements. Speaking of special effects, Paint.Net has a large number built in as standard; ink sketch, oil painting, blurs, distortions, noise control, red eye removal, sharpening, softening and so on. The image can also be manipulated by way of adjustments such as hue, saturation, level, brightness, contrast and sepia controls. The standard drawing and selection tools are provided and of course the intensity, tolerance or size of these tools can all be easily adjusted as necessary. The size of the application has increased quite considerably since the last release which weighed in at 1.6mb but regardless the application is still a tiny 4.8mb in size which in relative terms is about the size of one MP3 music file.